You are invited to celebrate the magic of Christmas with song at the 2019 Carols by Candlelight. Vision Australia's Carols by Candlelight is a Melbourne institution held at the Sidney Myer Music Bowl. This beloved family tradition has a long and proud history, turning 82 in 2019, the night promises to be as vibrant and captivating as ever. Bring your family and join us on Christmas Eve at the Sidney Myer Music Bowl for a night of unforgettable live performances. This is your chance to experience the magic of this timeless Australian tradition! All of the funds raised will go towards supporting kids who are blind or have low vision. Don't miss out on your chance to be part of this amazing Christmas spectacular! 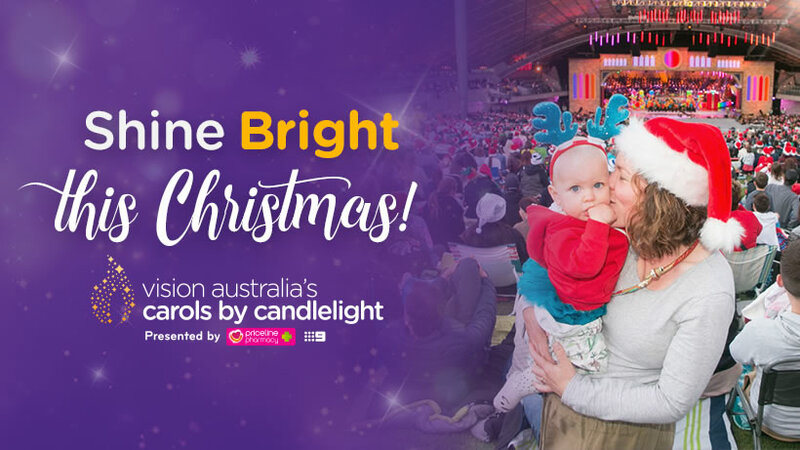 Make sure you're receiving all of the latest updates, as well as exclusive presales and offers, by signing up to the Carols by Candlelight Club. Tickets on sale: October - visionaustralia.org | Ticketmaster. Tickets will not be available at the Arts Centre Melbourne box office. Your donation will help Vision Australia achieve their 1 Vision of raising 1 Million in 1 Christmas. These vital funds will go to children who are blind or have low vision to lead happy, independent lives.